As the speaker in the video wraps up her lesson, she prays. All of us in the room grow quiet, listening in. The screen grows dark and before anyone launches the discussion questions, a friend speaks up. One of the amazing abilities of our Lord is reaching out to us individually while reaching out to us all. His sweet love and unique relationship with each of His children involves personal gifts and private moments. There are inside jokes and memories that hold us warmly, tucked into his care. One of the kindest, more precious things the Lord has taught me is this: He doesn’t just care for me, He cares about me. Sometimes the sunrise’s streak of gold peeking over the trees is just for me. The weather isn’t what everyone wanted, but He did it for me. I asked last night. Whoever donated those exact boots to the thrift store didn’t know it, but they were just for me, an unexpected gift from the Lord. My husband’s shoulder, though not his own selection, isn’t too large or too small. It’s just right- made, I believe, just for me and my heavy head. As I speak to God on a matter, asking a specific question, He rephrases it back to me with an answer through the song on the radio proclaiming truth I need in that moment. The lyrics are familiar, but that time, He played it just for me. At the end of one Saturday, I am tired of struggling to surrender something to Him and I’ve grown weary from the humbling that’s been happening. The reason I press on is the commitment I’ve made to obey Him in this matter. Settling into bed, I open a book I’ve been struggling to enjoy, one I’ve grown weary of plodding through. I’m reading it only because I committed to making it all the way through. The chapter rubs salve on my soul. Words just for me, custom shaped from an author’s keyboard to my aching heart by the Lord’s own hands. I open the good book, the only one I’m known to actually hug goodnight, and open to the page I left off on. This is His word, active and alive, and it quickly enfolds those feelings of fear in the triumphant embrace of the one who died just for me. Words spoken a couple thousand years ago, spoken right now to me by the same Savior. And because of Christ, I’m more than your creation. I’m your child. Do you know if you’re His child, too? 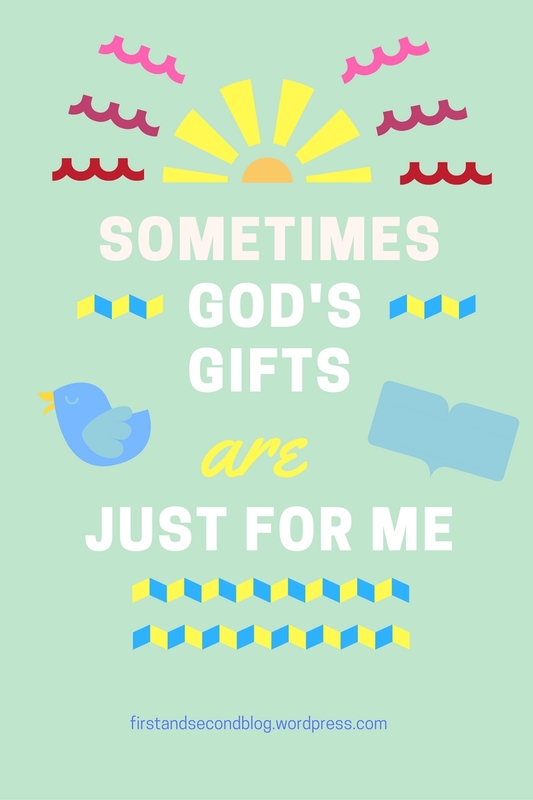 As His child, do you see God’s good gifts- the just for you kind? It’s a precious thing, that He cares so much for just me and just you. Oh, this is SO true! How many times have we all experienced the same thing…and each time it is so precious to behold. I still can’t believe that He loves me…it is so easy to believe that for everyone else, but as I look upon my faults and failures, it is hard to imagine how unconditional His love really is. Thank you for another edifying, encouraging post, Bethany! It is always amazing to me how the Lord delivers to each of us in such a personal manner. At times, He brings a corporate gift and at other times, it is just for the one. He cares for each one of us so uniquely. Blessings today! Amen, Joanne. That He is so personal and gives so personally sometimes always awes me. Glad you can identify! Amen Bethany! This is so true! God not only cares for me but He cares about me. Such poignant words of inspiration. May we always thank Him for His care and the blessings He bestows on us. Thank you for your prayer and for visiting my site today. I hope you have a wonderful week and may God richly bless you and yours in all your endeavors! I love those moments when God reminds us that he sees us and does something just for us. It’s amazing how he sees the big picture but he also sees our individual situations and needs, and how deeply each of us matter to him. Bethany, God is personal and personable – prayers. Neighbors at Susan’s today. Such a beautiful reminder today! Love how you show us pieces of your relationship with Jesus to encourage us in our own! Carrie, this is such an encouraging post. We all need this reminder sometimes. I love the way you reminded us that He doesn’t just care for us, but He also cares about us. Blessings to you! Thanks for linking up at the #LMMLinkup! Sorry, Bethany, I got the wrong name above. Blessings!